Choose 4 flavours for us to bring. We'll add strawberries in clotted cream & vanilla plus another two delicious flavours to make a total of 8 delicious cool treats to serve to your guests. 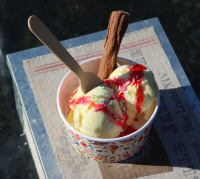 Every guest will be offered their choice of ice cream served in a waffle cone or a pretty waxed tub with the addition of sauces, sprinkles and a chocolate flake. 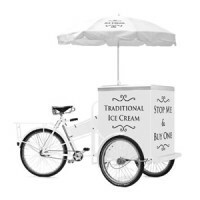 Most of the Marshfield Farm ice creams & sorbets are suitable for vegetarians & most are gluten-free too but if you need confirmation of contents then please ask us to supply you with Marshfields own allergins list. We can bring along diabetic ice cream or even a few ice lollies if anyone in your party isn't able to enjoy any of our ice creams. Let us know if there is anything we can do to help!